Bridget Riley's Comb, 1966 Collage: printed paper, paperboard, ink, and gouache on painted paperboard, 25 x 13 1/2 Museum of Modern Art. 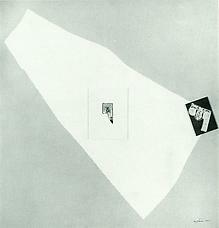 Large White Shape, 1965. Collage: paint, boards, sandpapered, mounted on painted board, 22 x 22 in. Richard L. Feigen. The Richard Feigen Gallery is pleased to announce the first showing in Chicago of Collages by Ray Johnson. Johnson was a member and an exhibitor with the American Abstract Artists in New York from 1949 to 1952. He exhibited at the David Herbert Gallery and the Reuben Gallery in New York, 1959-1862, and at the Institute of Contemporary Arts, Houston; Carnegie International, Pittsburg; PVI Gallery, New York; and the Batman Gallery, San Francisco, with a one-man show at the Willard Gallery in New York in 1956. Johnson, author of The Paper Snake, published by Something Else Press, is described by his publisher as “America’s leading Collagist.” In 1966 Johnson was the recipient of a grant by the Institute of Arts and Letters. Excerpted from October 6, 1966 press release.